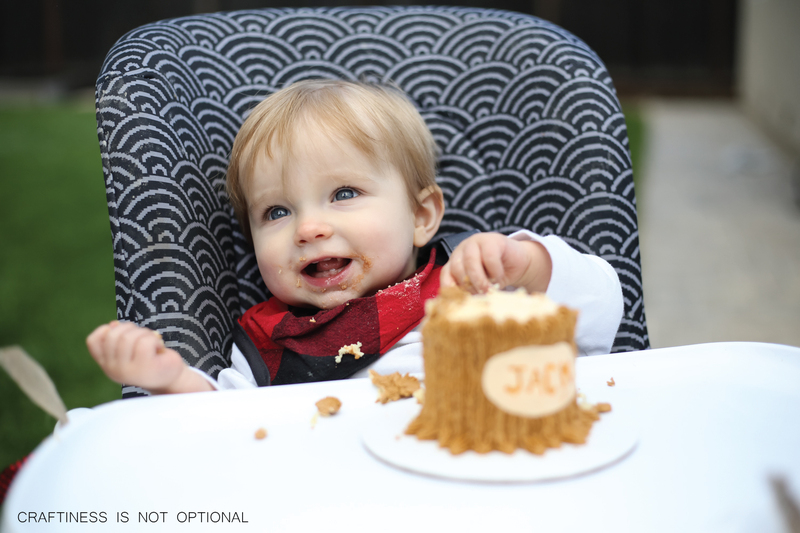 My first boy party folks! Well, for my own boy! I’ve helped with a few of my friends parties but it’s so fun to do my own son’s! 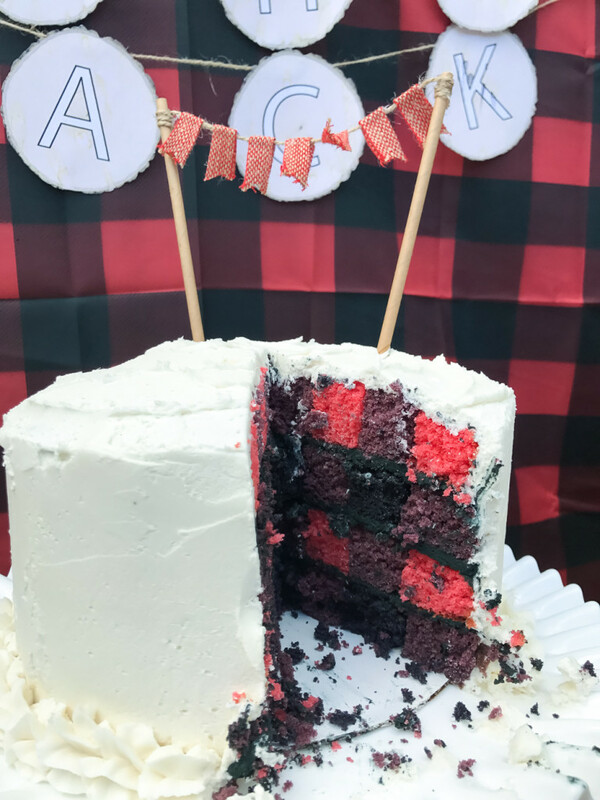 I figured, with the name Jack I HAD to do a lumberJACK party!! I had so much fun with this theme, and I decided on the theme before last Christmas, so I was able to collect lots of buffalo plaid items, since it was so popular last year! I decide to risk it and set up again outside, because well…I had this whole idea of how I wanted the party to look and really had my heart set on having it outside. It is after all, an outside wilderness forest kinda theme. Luckily the weather held after that and though it was a little chilly, we stuck it out and had a great time! phew. longest party story ever. moving on to the fun stuff! 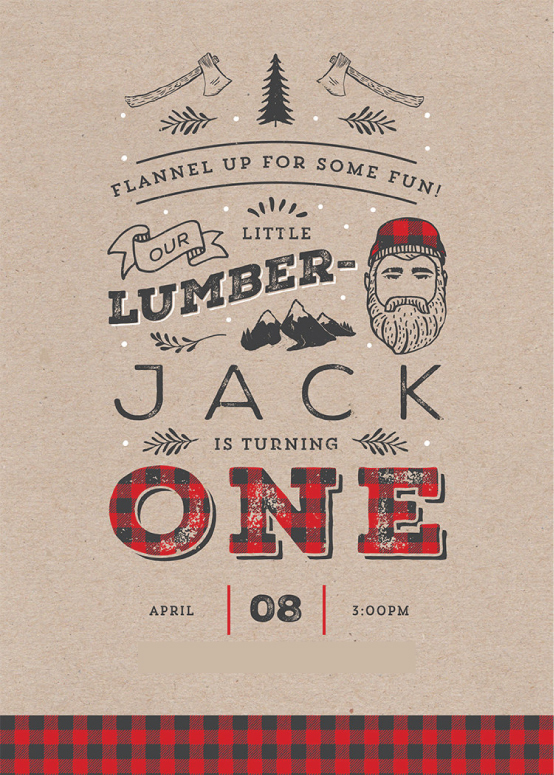 I was going to design my own invite like I usually do, but I found this one on Etsy and it was just about PERFECTION. Obviously I love to iron things the day of a party. yeahhhhh. 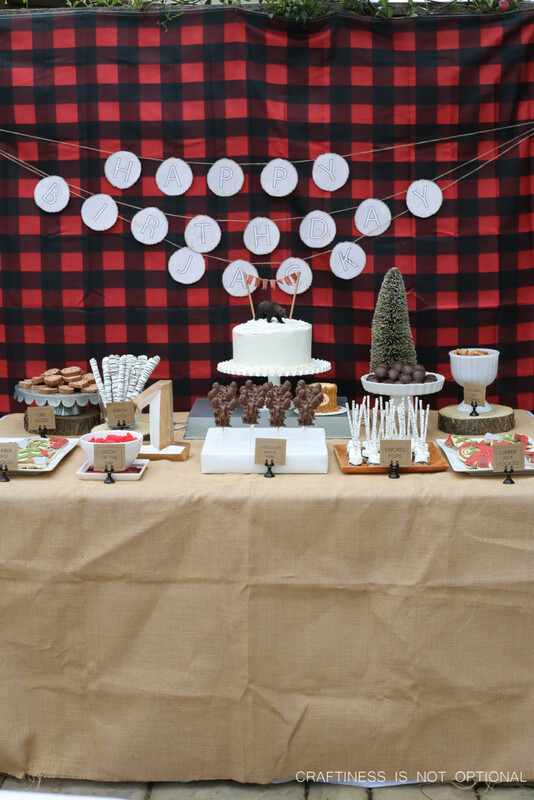 The wood slice Happy Birthday banner was one of the things that got damaged the most by the rain, the drops smeared the ink….but I still love it! I have it for you as a FREE download here! Just print the first two pages twice! 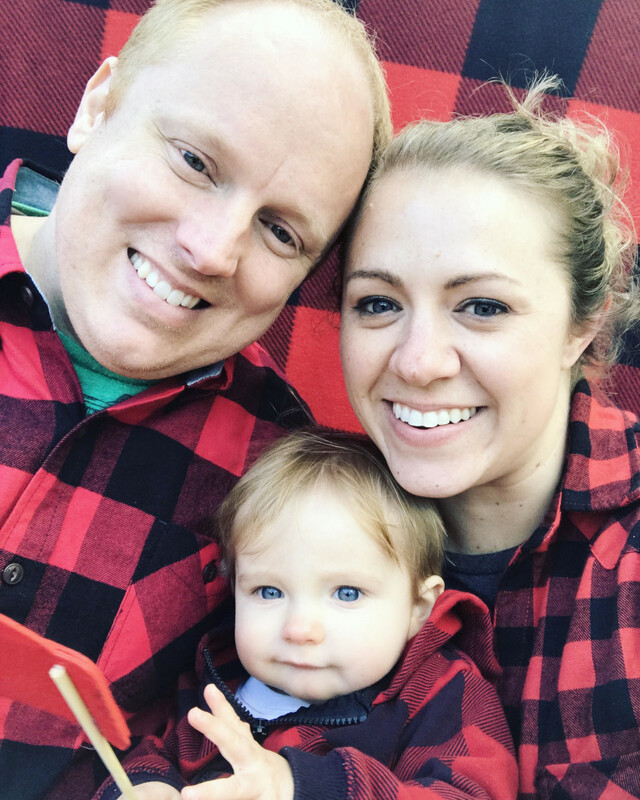 I got the backdrop on Amazon (there are affiliate links in this post, thank you! 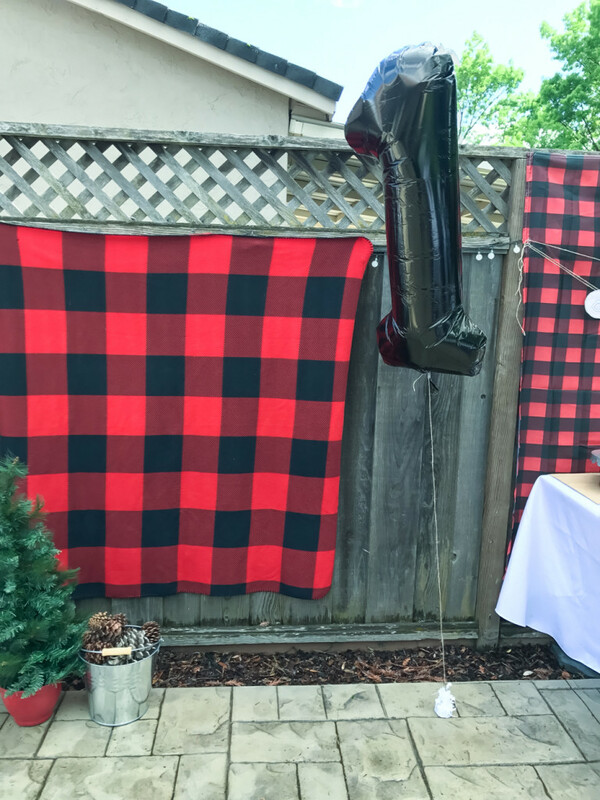 ), it’s actually…..a SHOWER curtain! 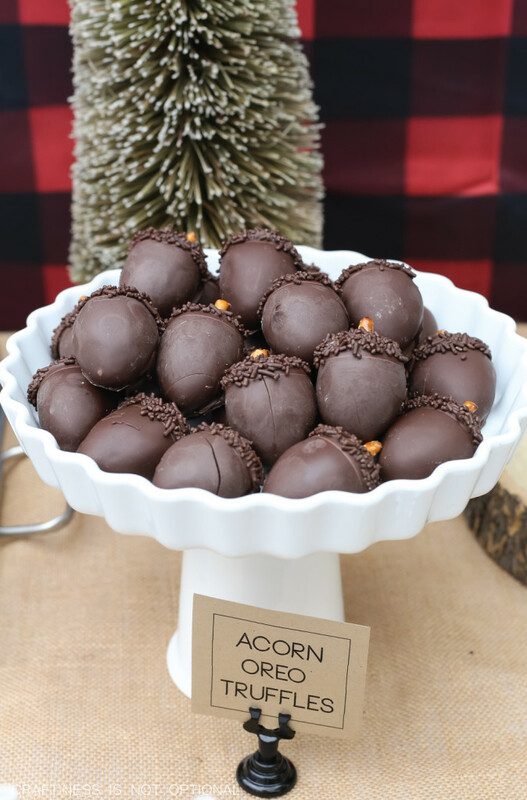 I love using these because they are usually the perfect size and you can get so many different kinds, usually for under $20! It wouldn’t be a CINO party without my sugar cookies! I don’t think there is a birthday party I’ve done without them, literally. 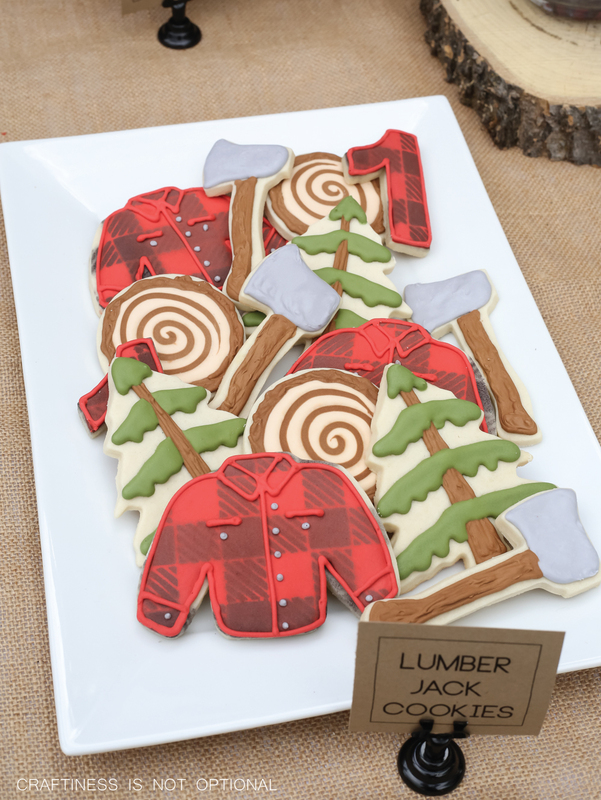 I made plaid lumberjack shirts (mini tutorial coming on how I did those soon), wood slices, rustic trees (these were especially easy and quick to make!, ones, and axes. 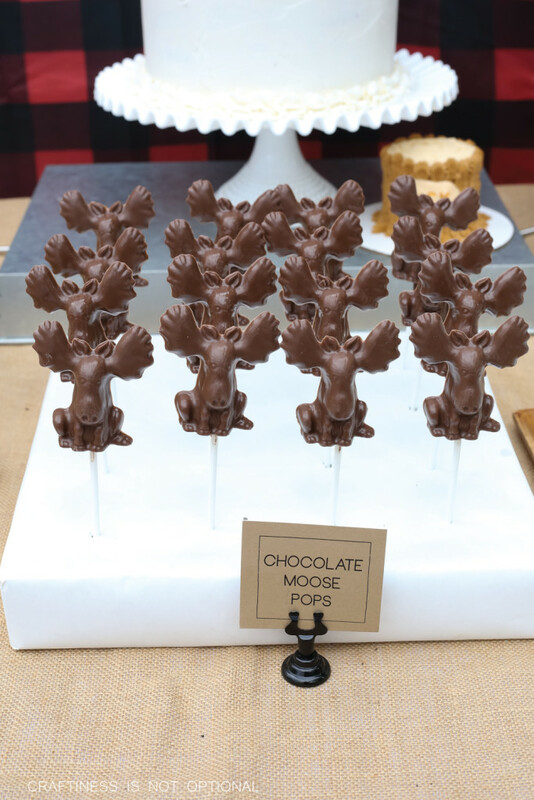 I made chocolate moose pops with this mold…they CRACK ME UP. 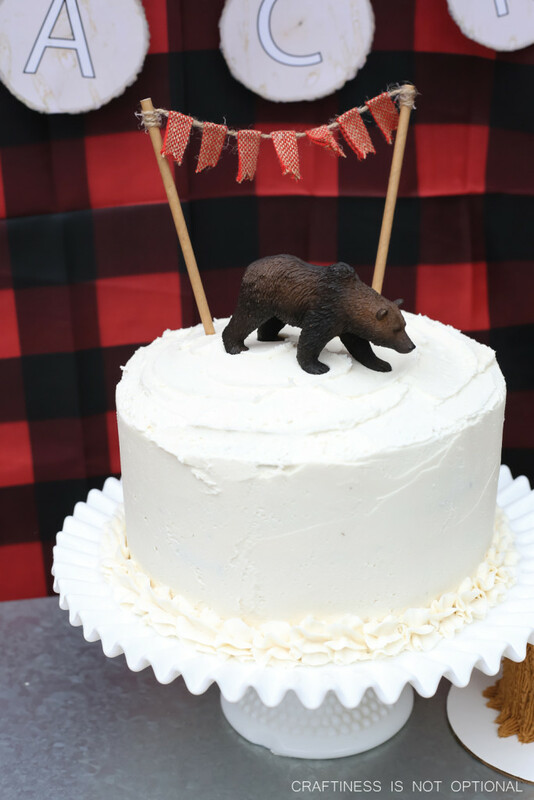 Grabbed this adorable little bear for the topper, and made that little flag swag out of twine, a few straws, and some burlap ribbon. 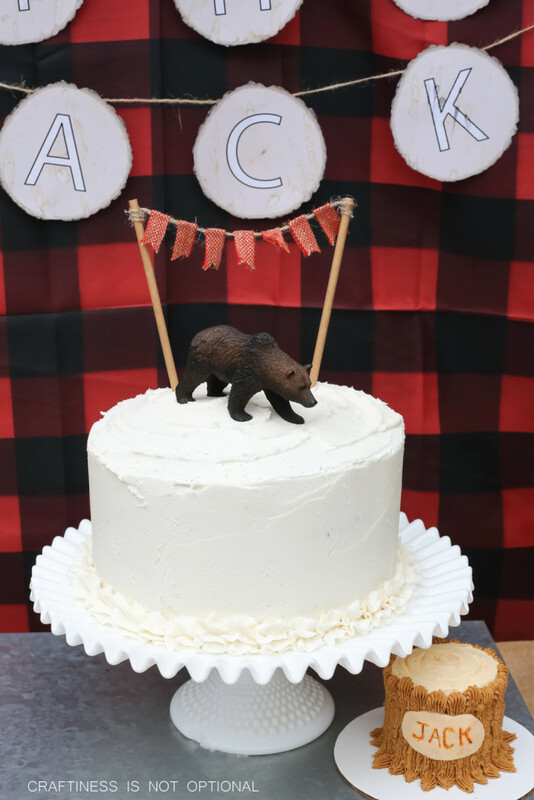 I made an adorable (simple!) smash cake for Jack! 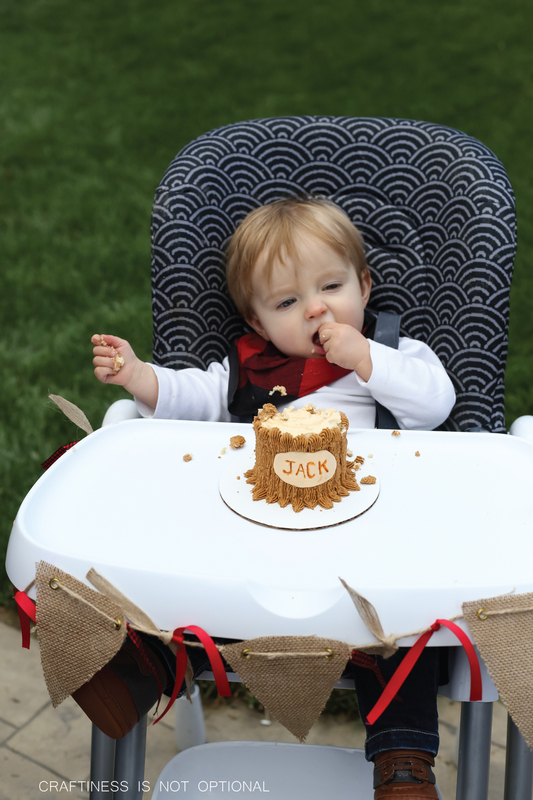 I baked one layer of vanilla cake, and used a 3″ circle cutter to cut three layers out. 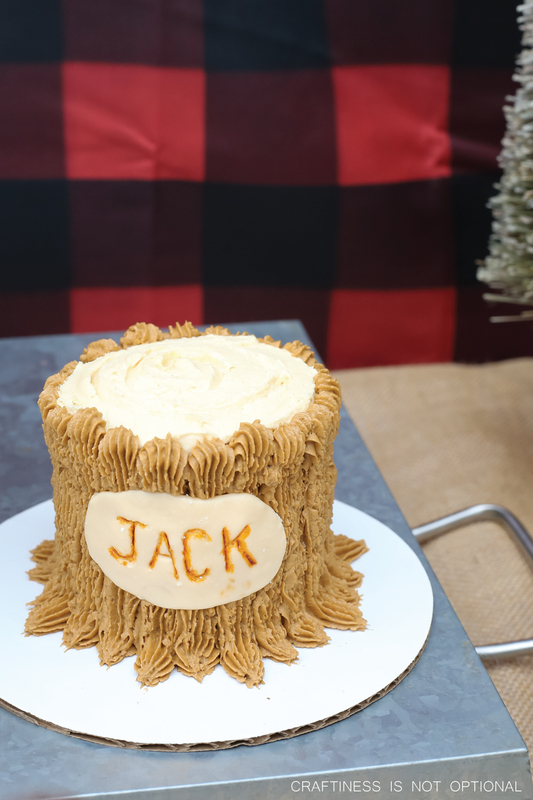 Then I simply layered them with a bit of vanilla frosting in between and then frosted the top with light tan frosting, and then used a piping tip with darker brown to create the bark effect! 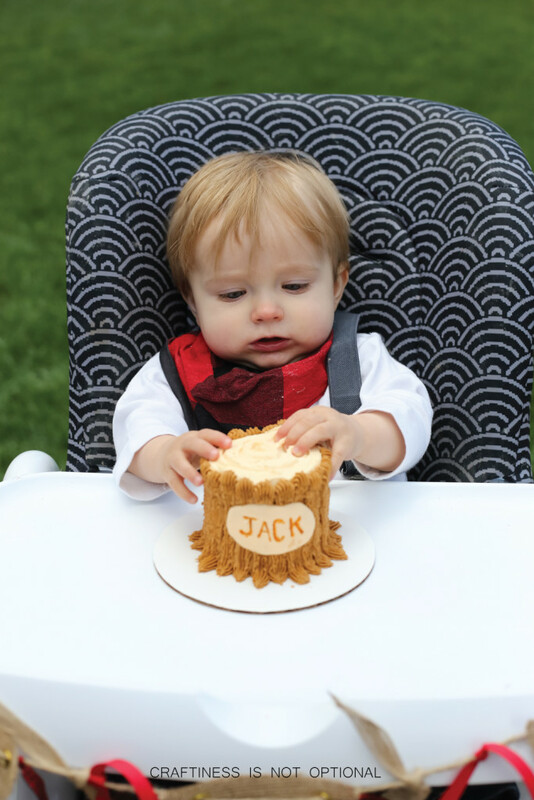 I made the tiniest bit of marshmallow fondant, rolled and cut out an oval, then used a toothpick to write out his name, then I used some brown food coloring to accent it! And the INSIDE!! 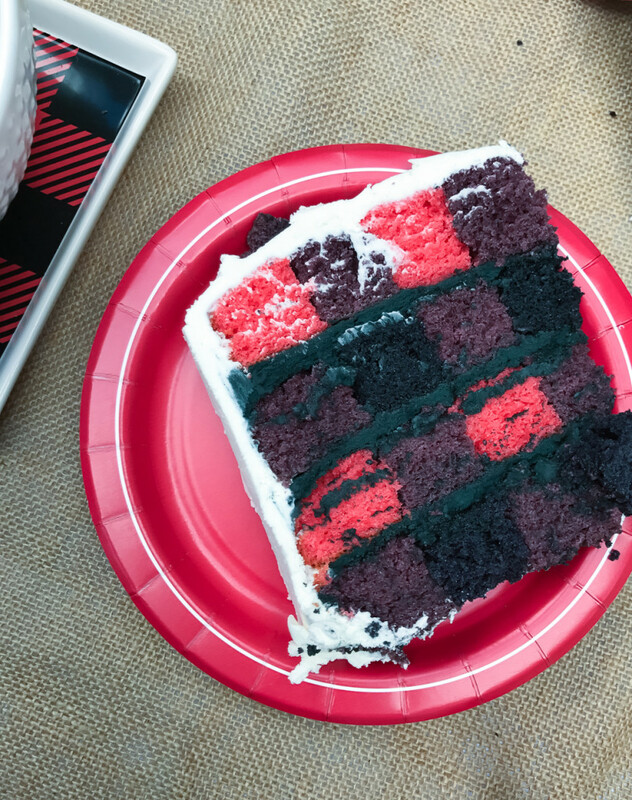 I made a checkerboard cake, and it was so fun and pretty easy too! I’ll see about a tutorial for this too! 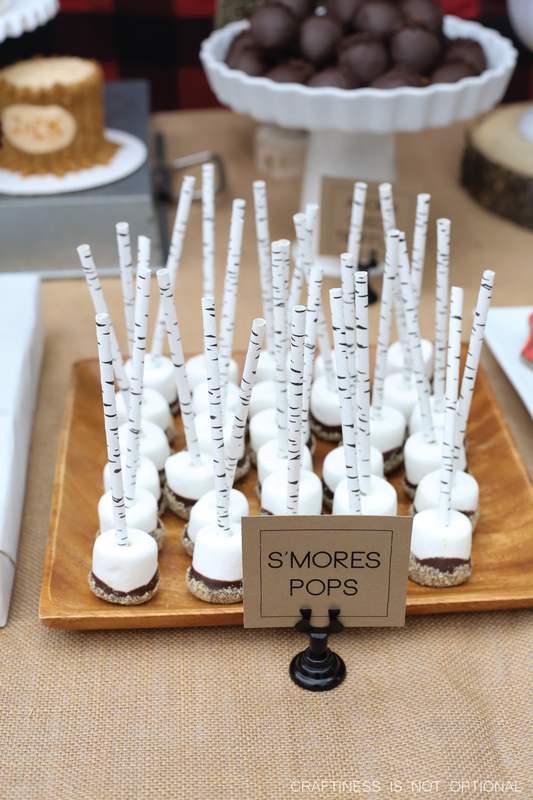 Some easy S’mores pops! 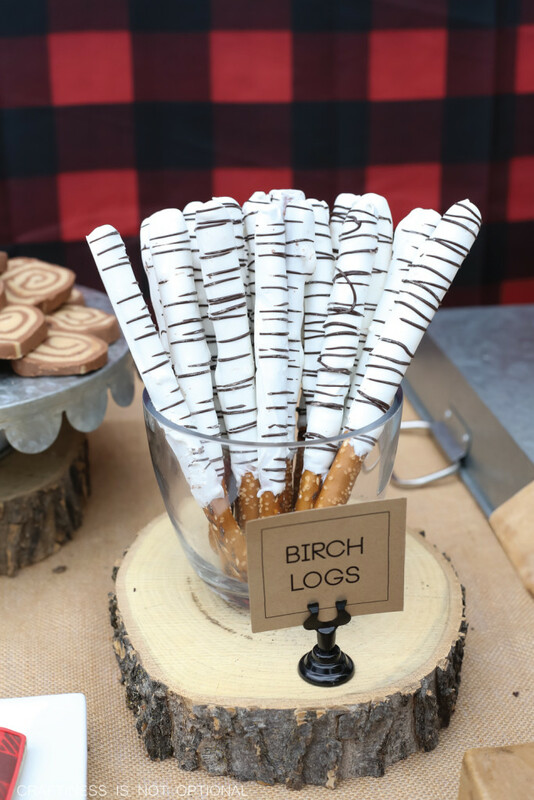 I used these birch tree straws, cut them down a little (actually had the girls do it! 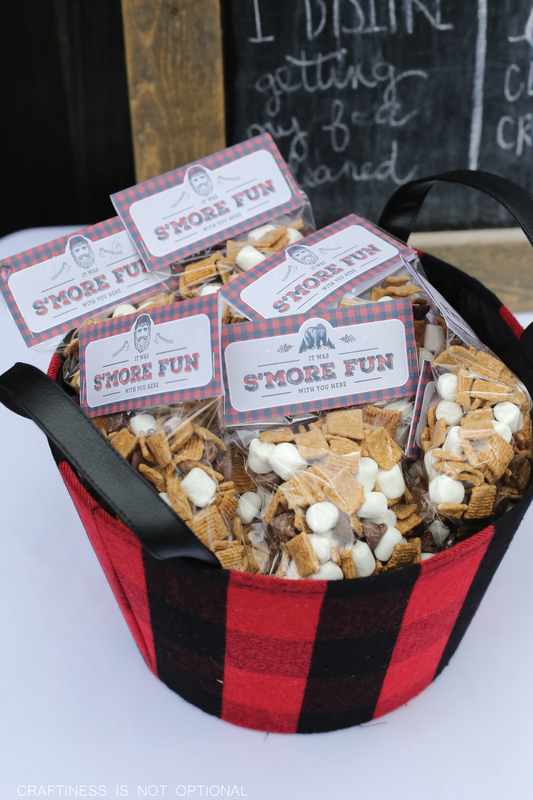 ), stabbed them into large marshmallows, dipped them into some almond bark, then some graham cracker crumbs. easy peasy! 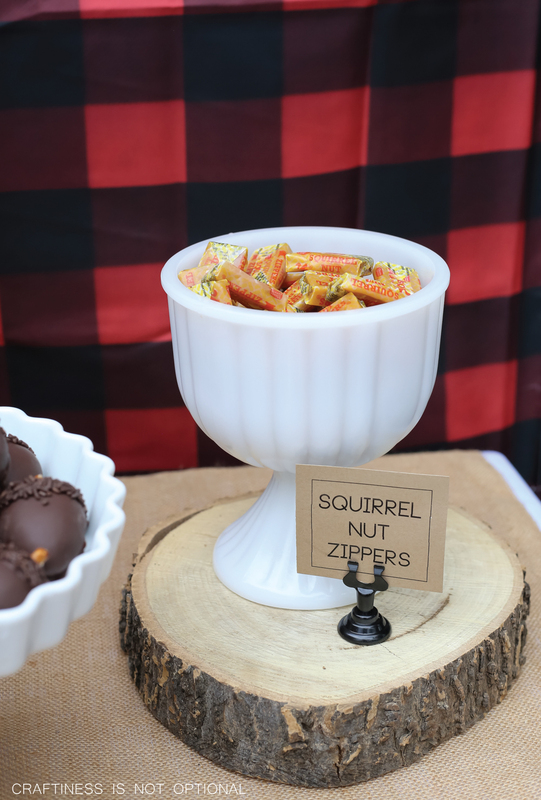 Some squirrel nut zipper candies-not the first time I’ve used these! 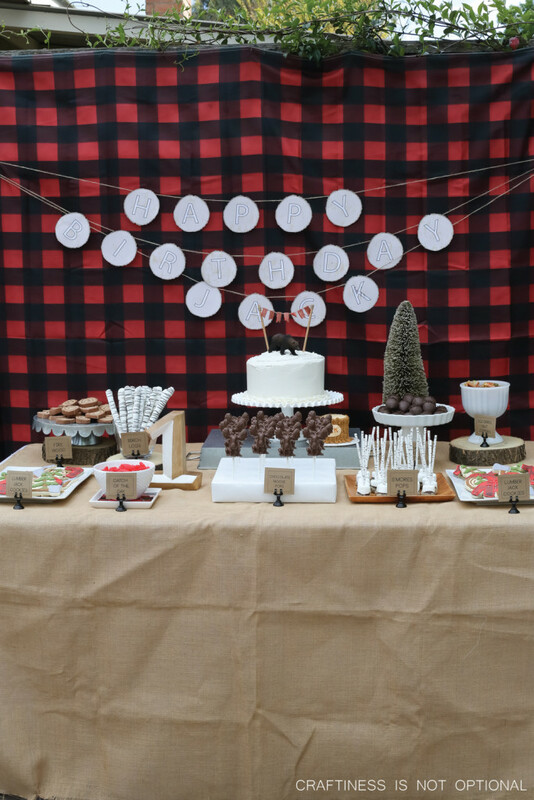 They worked perfectly for Ava’s woodland party too! Some easy acorn oreo truffles! Used this recipe/tutorial. Some “birch logs” which were also SO easy! I bought some pretzel logs and dipped them into white chocolate melts, and then drizzled dark chocolate on top. 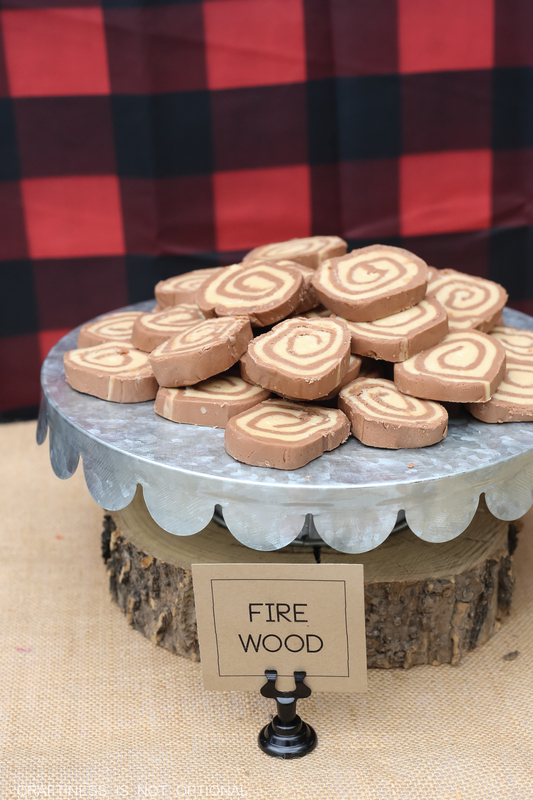 I made some wood slice aka “fire wood” fudge…using this recipe/tutorial! I used our kitchen chalkboard for this first birthday facts thingybob. 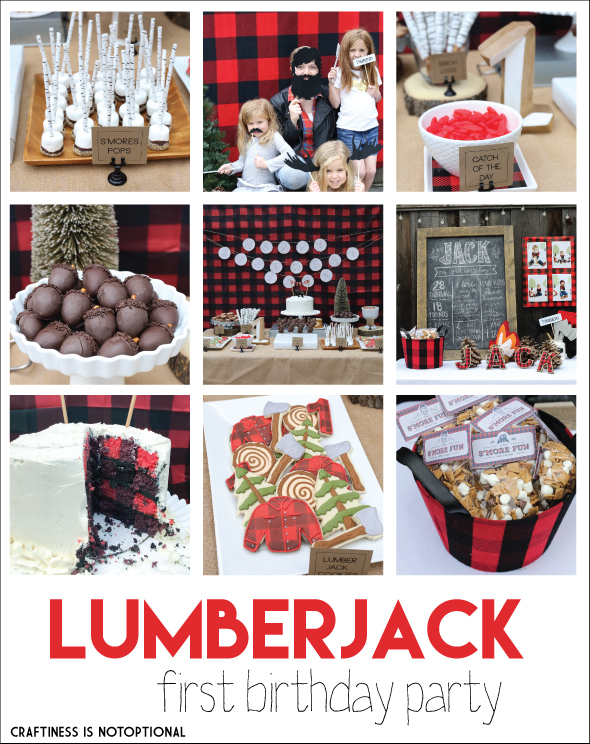 🙂 I also printed off some of his photos from the lumberjack photo shoot and displayed them. For the party favors, lately I’ve gotten a lot simpler…I like to do something edible lately, so I grabbed some mini marshmallows, chocolate chips, and graham cereal, then mixed them all up and packaged them up in some cello bags and these labels! 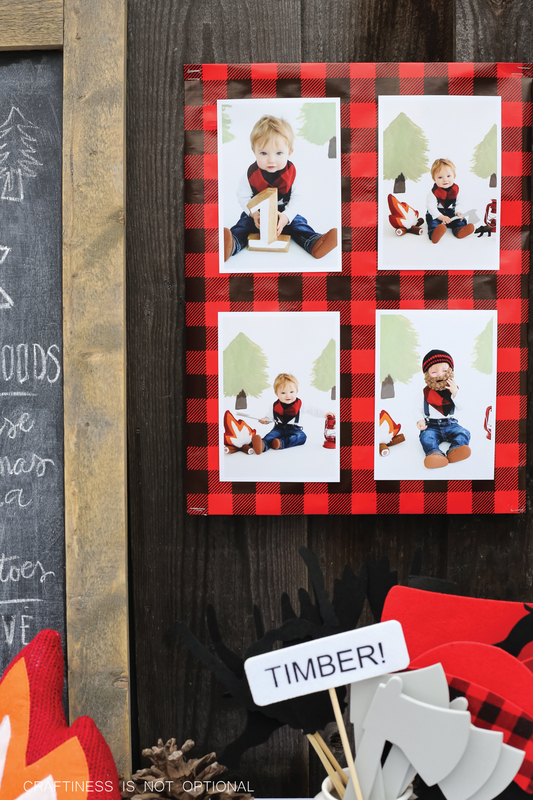 I found the little plaid fabric bucket at target around Christmastime 2016. 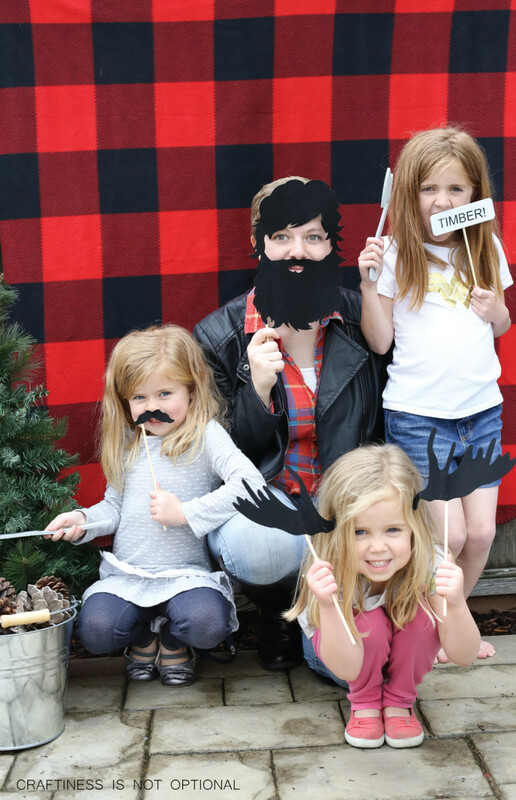 My friend Kami found this lumberjack photo prop set at Kohls last year for only a couple of bucks! I found the foam axes at Hobby Lobby. 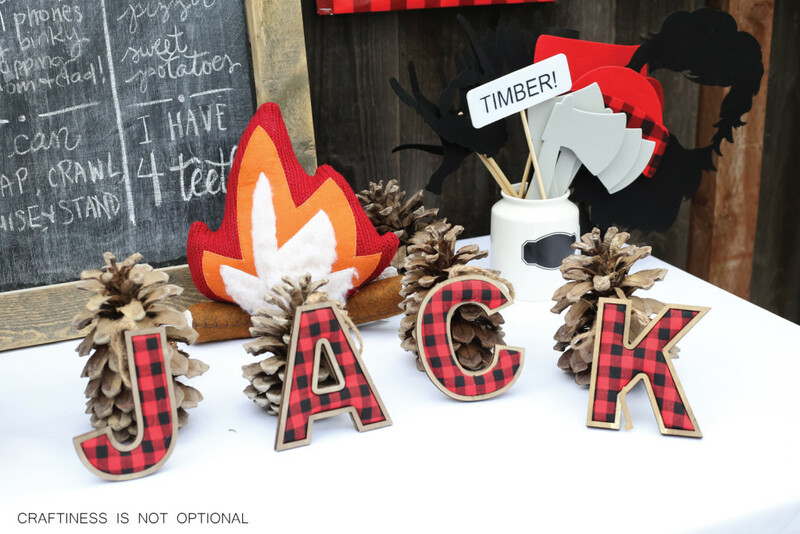 I also borrowed a bunch of pinecones from Kami, and grabbed the plaid letters at target last Christmas. 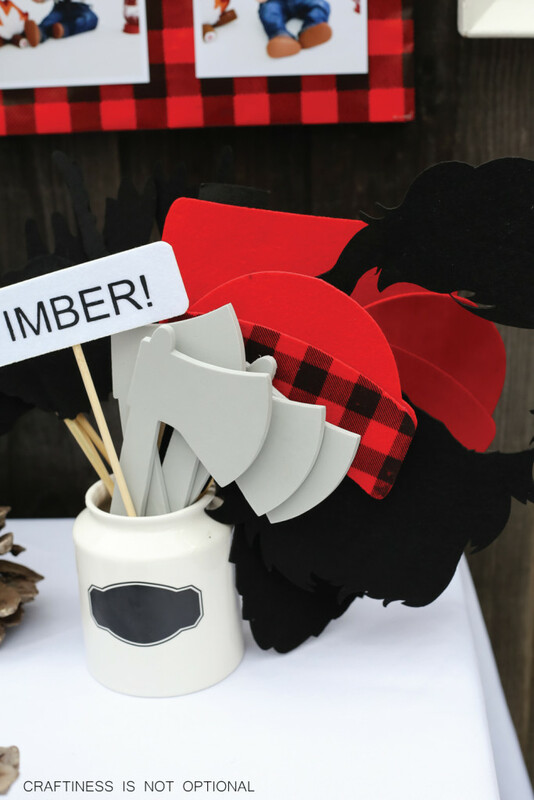 They are ornaments, so it’ll be so fun to add these to his ornament box and remember his first birthday party! The fire pillow is also from Target last year! 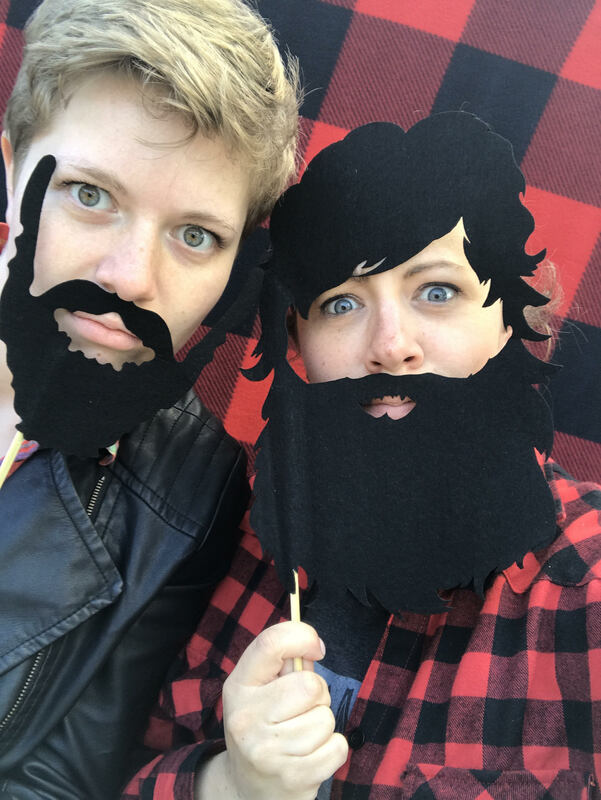 I grabbed the black number one balloon off of Amazon, the backdrop for the photo spot is a blanket I picked up for $5 at Old Navy, also last Christmas…I feel like I’m saying that a LOT. lol. The kids had so much fun posing! Ok, the adults did too. I packaged up some wooden utensils in these kraft paper bags and these napkins. I had this little chalkboard container on hand, as well as the metal container that the black cups and birch tree straws are in. I grabbed these wooden plates for our food, and they were the perfect size for our baked potatoes to fit on! 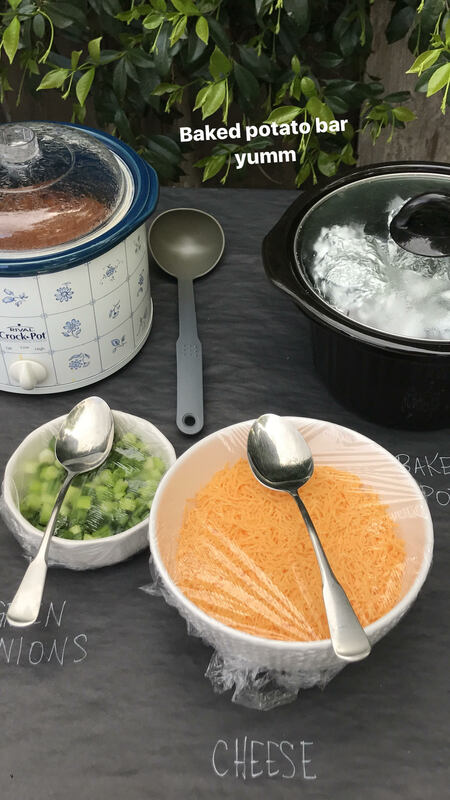 We had a plethora of baked potatoes available, along with all the fixins…except for sour cream. I forgot to put it out and my family was too nice to ask for it, thinking I just didn’t have any. LOL. whoops. 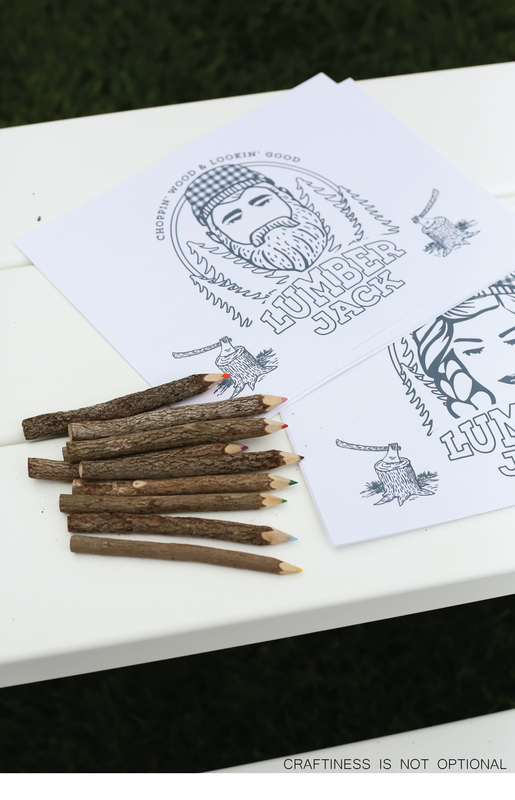 I printed off these adorable Lumberjack and Lumberjill printable coloring pages, and HAD to get these adorable twig colored pencils! I love to have coloring pages that fit the theme out for the kids to color! 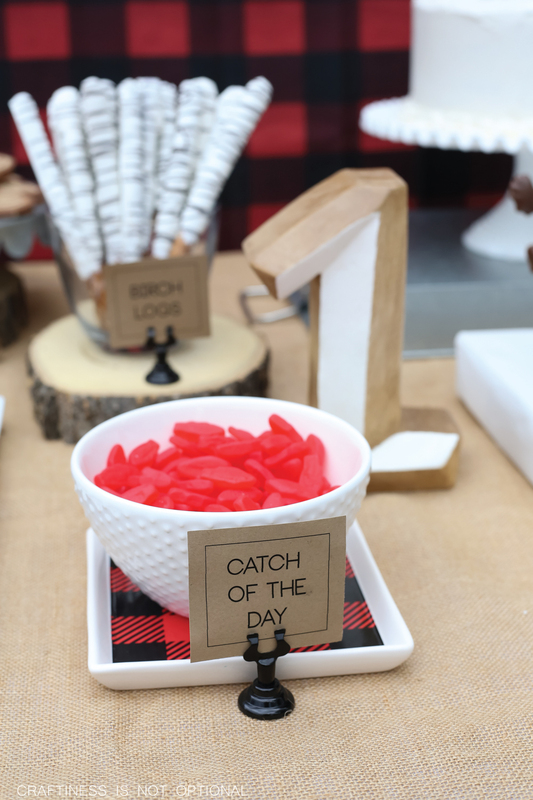 The centerpieces for the three tables were simple but I LOVED THEM. 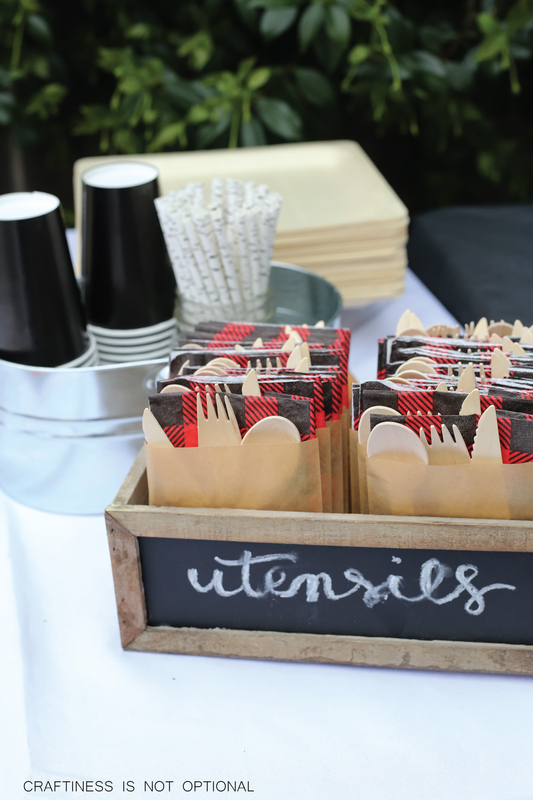 My gal Alisa found these adorable buffalo plaid napkins that I repurposed as table squares. She also found Rory’s shirt for me! 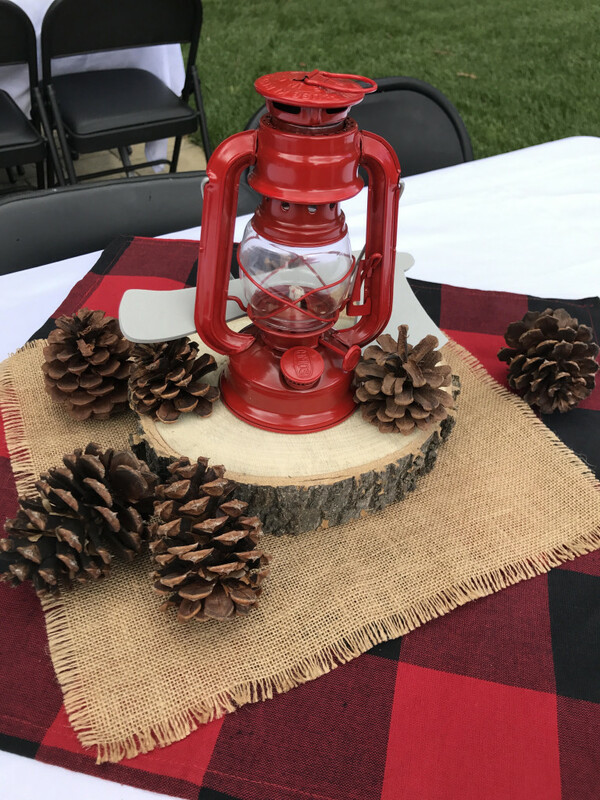 the burlap squares I had from another party, pinecones from my friend Kami, foam axes from Hobby Lobby again, and the adorable red lanterns from Amazon! 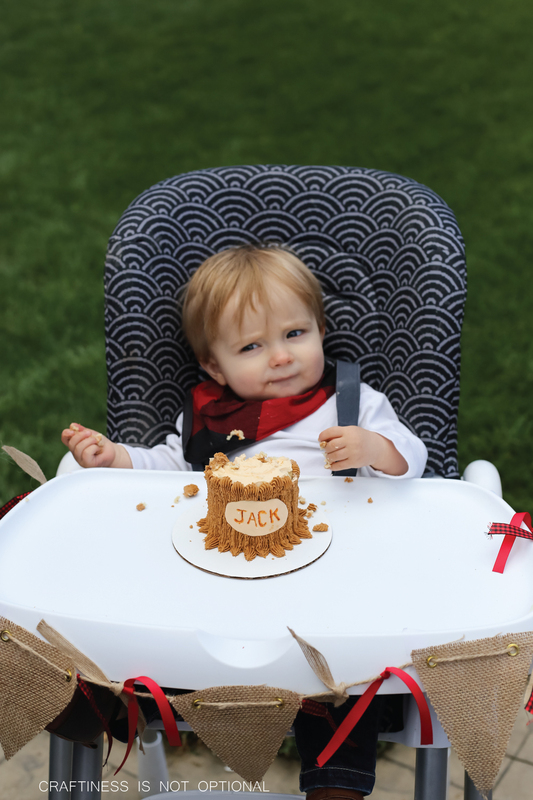 Ok, prepare for a plethora of Jack pictures! He was not quite sure about the cake, but eventually got into it! I just love this boy! 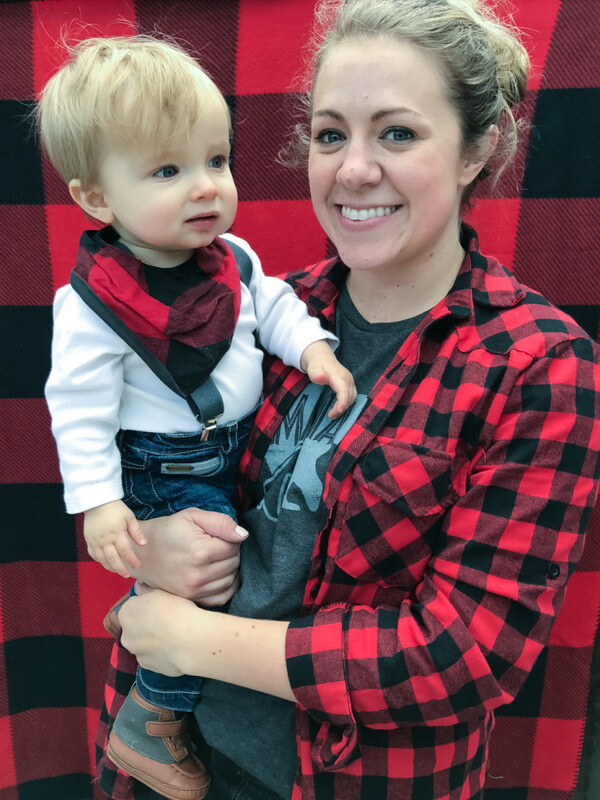 I grabbed this Mama Bear tee and plaid shirt from Amazon so I would fit the theme! 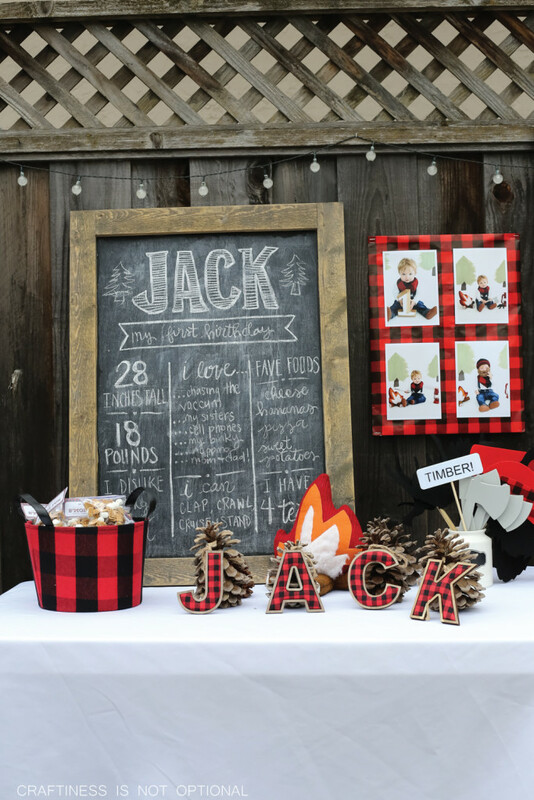 Love everything about this party! Great job! Everything looks great!! One day (in your spare time)… I would like to see how much time you give yourself to prep and get everything “photo” ready. You give the absolute best birthday parties! So many adorable things in this post! so many great details, so much fun, you are the absolutely, positively the party QUEEN! 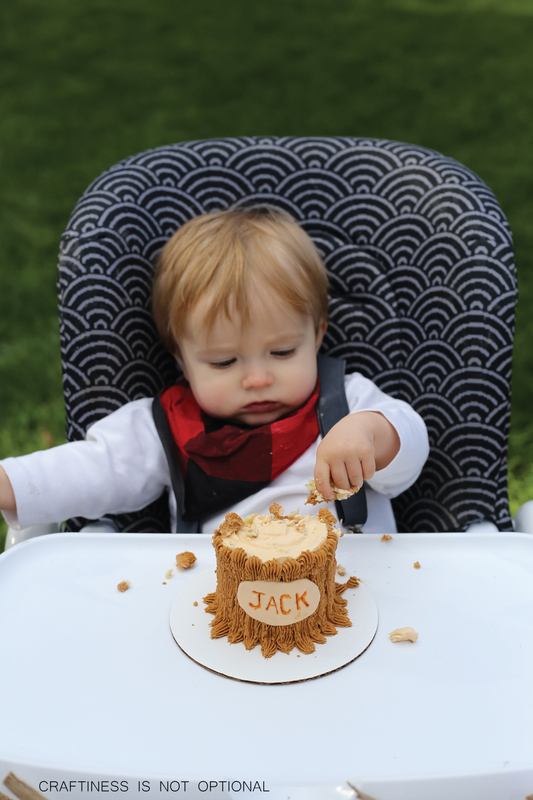 happy birthday jack! It looks funny, and so great ! Do you want to sell anything you have left over? actually, yes! I have a ton of stuff I need to sell! email me or contact me on IG @craftinessisnotoptional ! 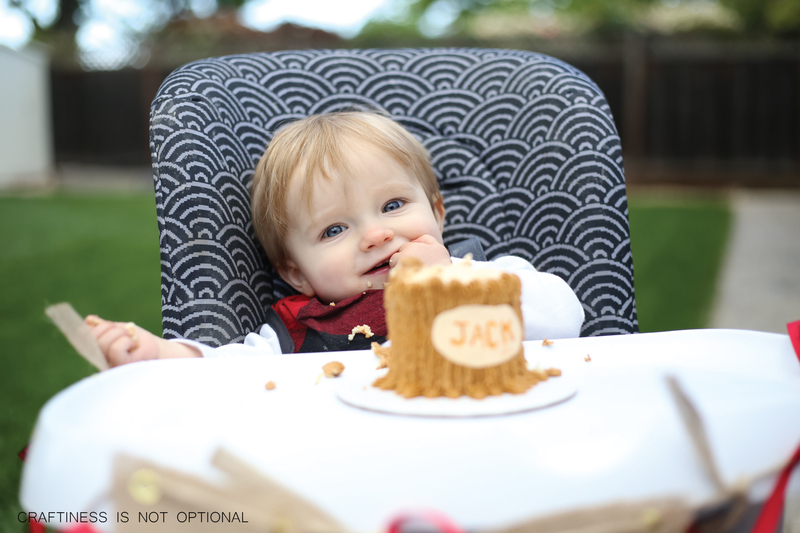 For the little tree stump cake, did you make the frosting or use it from a can?